BANGOR, Maine – Campus safety is a major priority at colleges across the nation. School shootings have become so frequent in the past decade that they are almost routine stories on mainstream news networks. No college wants to be the next institution that receives national attention for violence on campus. 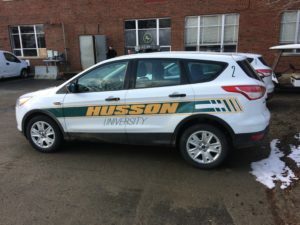 Husson University is located in a suburban Bangor neighborhood with little crime in the area, but campus security is still vitally important at Bangor’s only private college. Husson’s Director of Safety and Security Raymond Bessette works with the school’s Board of Trustees to find cost effective solutions to keep the Bangor campus safe. A Husson Security patrol car outside the university’s security office. According to Bessette, concerns about Husson’s vulnerability to a shooting attack arose after the Umpqua Community College shooting in October 2015. A male student killed 10 people and wounded seven when he opened fire in a classroom on Umpqua’s Roseburg, Oregon campus (New York Times). “The timing of that shooting led to impromptu discussions [with the Husson Board of Trustees] about if that were to occur at Husson, how well prepared are we for something like that to happen,” Bessette said. One issue that arose is the fact that Husson security officers are unarmed and lack the authority to make arrests. Only sworn police officers, those who work for a government entity and undergo specific training, may arrest individuals in the State of Maine. Husson’s campus security officers are unsworn because the university is a private institution. Despite this challenge, Bessette proposed a solution to keep Husson safe in the event of violence. School shootings don’t last long when they occur. Husson’s Board of Trustees approved Bessette’s recommendation. Armed Bangor Police Officer Justin Carter is currently stationed full-time at Husson. A contract between the university and the Bangor Police Department stipulates an hourly rate Husson pays for Officer Carter’s services. Faster emergency response time is not the only benefit of having Officer Carter on campus. Bangor PD has useful public safety data that cannot be shared with private businesses such as the university. Officer Carter has access to the Bangor PD database containing files such as arrest warrants and crimes committed in the neighborhoods bordering Husson. He monitors this information to help keep campus safe. Bessette did not discuss Officer Carter’s on-duty hours at the university. He said that would put Carter and Husson Security at a “tactical disadvantage”. Carter’s primary objective is to assist Husson students with safety matters outside the jurisdiction of campus security. Bessette emphasizes the importance of “building community” between Officer Carter, Husson Security officers, and students. Bangor police officers are only stationed at Husson for two school years before a different officer takes over. This allows multiple members of the Bangor PD to build connections with Husson in the long term, Bessette said. Husson makes a considerable investment to pay for Officer Carter to be on campus full time. Bessette says this is more economical than arming Husson Security staff. It would also be a major insurance liability if Husson armed its unsworn security officers. Bessette said unsworn campus security staff do not receive the same legal protections as police officers with public departments (in the event that an officer shoots someone). Insurance costs for the university would consequently increase a lot if campus security guards carried guns. Officer Carter is already armed, trained, and indemnified as a government entity. He is therefore a lower insurance liability when armed than Husson Security officers would be with weapons. Bessette and the Husson Board of Trustees support the peace-of-mind and public resources that Officer Carter brings to campus. It is a significant investment to have a Bangor police officer at the university full-time, but Husson administration believes the benefits outweigh the costs.